Sorry folks. 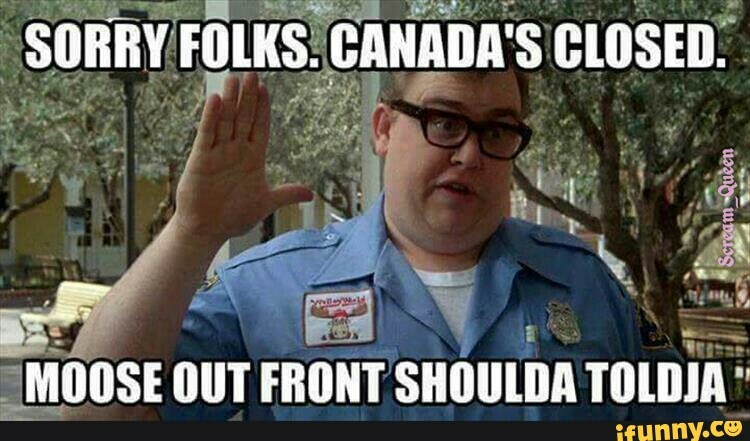 Canada’s closed. Moose out front shoulda toldja! If only the USA had the immigration system that Canada has. So many rich and famous people claimed, if Trump won, they’d pack up and move to Canada. About 2.5 Million people in the USA made that promise and now most are backing off it because of the points system in Canada. George Soros is behind the protests against Trump. He wants to pay people to protest because his puppet Clinton was not elected. Canada is closed to US immigrants, who have no good skills to offer Canada to qualify for entry as an immigrant. They learned from people dodging the draft during the Vietnam War and made it harder to get into Canada. Nice site… but disqus is not your content? I guess it’s not possible to post stories to your blog either then? Nobody is using them yet. Disqus is easier to use than the WordPress comments. The Forum plug-in allows Forums. I am still learning about WordPress.